Improve curb appeal and boost your home value. You can do a little or a complete makeover. Install sod and plants if you are getting ready to sell your home. Great sod installation video showing techniques on how to install sod. Sod gives an instant lawn area and it is easy to install. It’s December and we have had more than one hard frost. The perennials and ornamental grasses have died back. The leaves are off the tree. If not for the dwarf conifers, your garden would be barren. During the winter months it is your evergreen shrubs that add the texture and color that are the mainstays of your winter garden. Dwarf conifers can take the form of pillars, round balls or flat ground covers that add that visual punch that is needed for your winter garden. Green Arrow Weeping Alaska Cedar: (Chamaecyparis nootkatensis) Tall and narrow growing to 20 feet in 10 years. Dwarf Colorado Blue Spruce: (Picea p. ‘Glauca Globosa’) Globe shaped conifer growing to 3-5 feet with bright blue color. Hardy down to -40 degrees F.
Weeping White Pine (Pinus strobus ‘Pendula’) Grows to 15 feet tall with a 10 foot width with graceful weeping branches. It has blue green foliage with long ornamental needles. 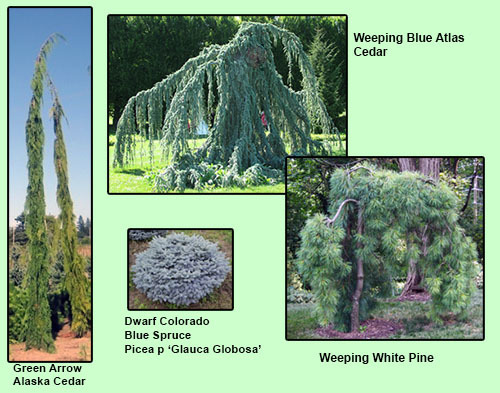 Weeping Blue Atlas Cedar (Cedrus libani (ssp.atlantica)’Glauca Pendula’). Makes an ideal specimen tree with its drooping and twisted branches. Powdery blue needles are attention grabbing. 10 feet tall and 15-20 feet wide at maturity. Great overview video on how to prepare and install a new sod lawn. For more step by step instructions please go to our step by step sod installation instructions. Remember to properly install a new sod lawn follow these simple steps. 1. Test your soil and then add in fertilizer, lime and any necessary soil amendments. 2. Rototill or hand till the soil. 3. Level and compact the soil. 4. Moisten and install your new sod. 5. Roll to compact your new sod into the soil. 6. Keep watered and stay off the grass until rooted. For high quality sod and personal attention and advice, come to the Far West Turf Farm located in Woodland, Washington. Located just North of Portland, Oregon and your perfect source for Portland Sod. Call us at (360) 263-4700 for more information. How Much Water for the Perfect lawn? 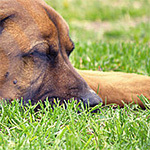 Is your pet stopping you from having a beautiful, lush green garden? You don’t have to worry any more. There are ways to create a Dog-Friendly Yard which is not only beautiful but also enjoyable for your pet too. You need to achieve balance between your landscaping design and your dog’s behaviors, habits and personalities. The following tips will provide you detailed information on creation and maintenance of Dog-Friendly Yards. Remember that every dog is different and has distinct characteristics and personalities. It is important to design landscaping in a way that your dog enjoys the time spent in the garden and at the same time gets some exercise and be able to perform their fun activities. Digging: Does your dog like to dig? If so it is important to create a spot away from your plants in a shady area so that digging activity there and doesn’t disturb your plants. If your dog loves tunnels, they can be made with wires between plants so that the pet can enjoy in there. Clean-up: Provide an area for your dog to relieve themselves that is covered in pea gravel or wood chips. This will save your lawn from all the dead spots when your dog chooses their own area. Safety: Picking up of plants and pesticides for your garden is critical when you have pets. Poisonous plants and hazardous fertilizers, pesticides, chemicals should be avoided. Also plants near paths should not have thorns. Objects like garden hoses should be kept away to avoid any unwanted incidents. Exercise: The ideal Dog-Friendly Yard should have sufficient free space for the dog to run, play and complete their fun activities. Expensive plants are not needed; instead colorful hanging baskets can be used for the eye treat. Also a well-designed dog house can be built at some corner so that your dog gets an outdoor shelter and stays cool. Since people love their pets as much as they love their gardens, it is important to design Dog-Friendly Yards keeping in mind all the above points so that your dog, who is a member of your family, will have safe, healthier and fun atmosphere to play and complete their activities.